The awesome and scenic Pacific Northwest Cascade volcanoes have a dark side: they can be geological hazards. While the threat of a volcanic eruption seems obvious, examining the detailed hazards can help us lessen their impact. And, there are also non-eruptive volcanic hazards. The greatest volcanic hazards in the Pacific Northwest are: pyroclastic density currents, ash fall and lahars. Lava flows usually do not have great impact in our region because our Cascade volcanoes tend to erupt more viscous (thick, sticky) types of lava, which don't travel very far. Eruptions of basaltic lavas, which produce thin, far-travelling lava flows can occur in the Cascades (particularly in southern Oregon), but are more common in the volcanos of the Hawaiian Islands and at plate boundary spreading centers. This has not always been the case here. 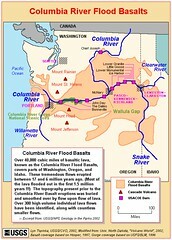 East of the Cascade Range, between 17 and 6 million years ago vast amounts of basalt flowed across the land surface, leaving the many layers of Columbia River Flood Basalts.